Today marks one week since the speech by Dianne Feinstein on the floor of the US Senate in which the California Democrat, chair of the Senate Intelligence Committee, publicly charged the CIA with cover-up, the withholding of documents, and unconstitutional spying on her committee, which has the legal responsibility to oversee the spy agency. Top officials in the Obama administration, including the president, are potentially implicated in impeachable offenses. There is a vast gulf between the significance of the revelations and their treatment in the American media, which is moving as quickly as possible to bury the story. Since Friday, there has not been a single news article on the topic in major daily newspapers such as the New York Times, the Washington Post and the Wall Street Journal. The only major newspaper to publish an editorial on the topic in recent days was the Washington Post, but this was only from the standpoint of obscuring the far-reaching implications of Feinstein’s allegations. The editors, clearly concerned about the potentially explosive consequences of the revelations of criminal activity by the CIA, called Monday for quick publication of the Senate Intelligence Committee’s 6,300-page report on CIA torture, along with an internal CIA review of the agency’s torture program and Brennan’s rebuttal to the Senate report. This is, they write, necessary to “maintain the essential confidence of the American people” in the spy agencies. During the network television interview programs broadcast Sunday morning—which serve as a round-up of major political developments during the week—the CIA spying revelations were hardly mentioned. Two of the networks, Fox and CBS, avoided the subject entirely, while NBC and ABC took it up in a perfunctory and hurried fashion. Among those interviewed prominently were Representative Peter King, the Republican chairman of the House Homeland Security Committee and member of the House Intelligence Committee, and Mike Rogers, the Republican chairman of the House Intelligence Committee. Neither said anything about Feinstein’s Senate speech, nor were they asked. Along with the media, Senate Republicans and Democrats (including Feinstein herself) and the Obama administration are seeking to minimize the consequences of the exposure of CIA criminality and ensure that there are no serious investigations, no public hearings and no consequences for those implicated. According to a report by National Public Radio (NPR), the Senate Intelligence Committee held a closed-door meeting last Thursday at which it decided to conduct a secret review of the actions of the CIA and the counter-charges by agency officials that committee staffers obtained unauthorized access to CIA internal documents. Senator Richard Burr, the second-ranking Republican on the panel—set to become its chairman if the Republicans win control of the Senate in November—made clear in comments to NPR that the purpose of the review was to impose a blanket of silence on Feinstein’s statement. “We’ve made a decision that we’re going to pursue that as an internal course within the committee,” he said, “and hopefully that will end any public review of most of the comments that are being made.” Burr is on record declaring that the public should never learn anything of what is discussed in the closed sessions of the intelligence panel. Senate Democrats and Republicans alike have rejected suggestions that an independent investigation be launched, given the extraordinary seriousness of Feinstein’s charges and the clearly unconstitutional character of any executive branch effort to spy on the activities of the legislative branch. The Obama White House has downplayed the significance of the conflict and sought to present Obama as above the fray, although Brennan is one of his closest aides, having run the drone-missile assassination program from the White House for four years, until Obama nominated him to head the spy agency. Brennan notified the White House before filing a criminal referral with the Justice Department against Senate Intelligence Committee staff members and received a green light for the unprecedented action. 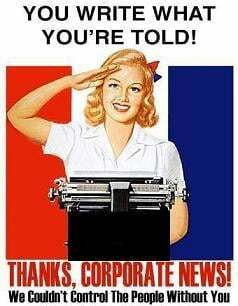 In this political conspiracy, the US media is once again playing its assigned role, not to reveal, but to cover up and obfuscate, a role that it has reprised many times over. In doing so, it is confirming its essential function as an arm of the state and an instrument of the corporate and financial elite and its assault on the democratic rights of the American people.